UltraBoard Core Peel N’ Stick is a foam core board made up of a high-density polystyrene core faced on both sides by smooth clay coated paper. 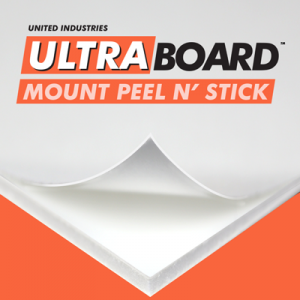 UltraBoard Core Peel N’ Stick features a high tack adhesive on one side with a white liner that provides a color neutral mounting surface. Boards are available in white, and are 3/16″ thick. UltraBoard Core Peel N’ Stick is a foam core board made up of polystyrene core faced on both sides by smooth clay coated paper. 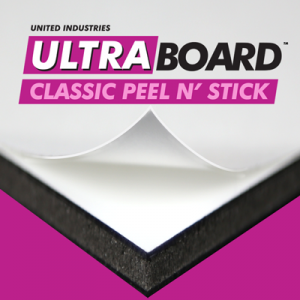 UltraBoard Core Peel N’ Stick features a high tack adhesive on one side with a white liner that provides a color neutral mounting surface. Boards are available in white, and are 3/16″ thick. 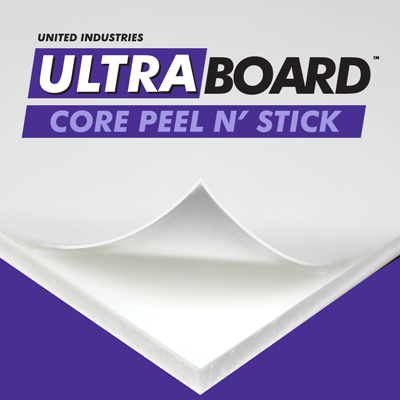 UltraBoard Core Peel N’ Stick panels are available either trimmed or untrimmed.